Guardian damp proofing employ fully trained Certificated Surveyors of Remedial Treatments (CSRT) who have gained their qualifications through the ‘Property care association‘ formerly part of the BWPDA and are conversant in the latest diagnostic techniques and the most up to date treatment methods available. 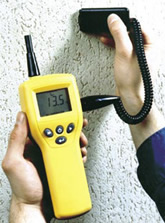 They have many years of experience of surveying damp in all types of buildings of all ages. As well as the CSRT qualification our surveyors have an extensive understanding and knowledge of building techniques and materials. Our surveyors have previously worked in the building industry as tradespeople. Guardians surveyors will have studied the following modules and passed the exams in order to use the CSRT initials. * Surveying procedures for all timber related infestations. * Surveying procedures in the diagnosis of dampness.